As a pescatarian, I have to be cautious about taking a moral high ground when it comes to the killing of fish. After all, some of those supposedly sustainable meals I consume have been allowed to die in the most inhumane of ways, crowded and suffocating, or even gutted alive and processed while still twitching. However, there’s a difference between fish dying for food, and fish dying for entertainment, and I suspect that the attached video will get pulses racing, and lead to a surge of angry comments on the strength of the latter sentiment. 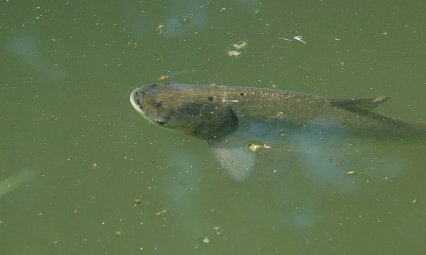 The Silver carp - Hypophthalmichthys molitrix – has become the object of attention for a group naming themselves the Peoria carp hunters. This self-styled Ninja clique has devised the most extraordinary pastime for itself, adorning spiked, armoured suits, and taking to waterskis. Wielding Samurai style swords, bladed helmets and Freddy Kruger-esque gloves, they randomly slaughter as many of these fish as they can catch – which doesn’t seem to be many. The video below (to be watched at your own discretion) shows skiers thrashing through the air with blades, as the fish leap from the water, in apparent reaction to the wake of the passing boat. Aside the entertainment factor gained by the ‘hunters’ there seems to be little point to the exercise, and the idea that the method might be a control for these fish is nonsensical. The Silver carp is a species hailing from Asia, and is the most intensely reared aquaculture fish in the world, based on weight. Known also as flying carp, they take to the air when startled, as is seen. In fairness, it is considered dangerous to waterski where these fish are present, and injuries are known from airborne collisions, including broken jaws, noses, and even damaged spines. As invasive fish go, Silver carp are a nuisance, but their full environmental impact isn’t fully understood. Being planktonivores, they risk outcompeting other plankton feeders, but unlike other troublesome fish like Zander, they do not directly consume other species, and their effects may take some time to monitor with accuracy. Either way, the video will not to be to everyone’s tastes. For myself, I feel that whether the fish needs to be culled or not, there should be a modicum of respect accorded in the method used. And dressing up like a Ninja warrior on water skis doesn’t seem to have that much regard for the animal being killed.